These were some of the first old photos I picked up when I began collecting. The green and dark brown cabinet card mounts are especially attractive and I love how crisp and richly saturated the images have remained after more than 130 years. All the photos were taken at the same studio, Mast, in Marshall, Michigan, but only the photo of the couple has writing on the reverse. The youngest girl is wearing what appears to be the same, or a very similar, necklace as the woman. While I typically do not buy photos without some attribution, the previous observations, as well as the fact that the girls look to be either sisters or the same person, led me to purchase all of them, as I wanted to keep the photos together. The notations on the back of the couple’s card have something that I’ve come to relish in a find…a date. I quickly realized that photos with dates, even if they have no name, are a wonderful thing to have in a collection, as you can put the sitters’ fashions, hairstyles, and accessories with that moment in time. There are many wonderful guides that provide tips for dating photos in this manner, and I often refer to my 19th Century Card Photos Kwik Guide by Gary W. Clark when looking for clues, but, having actual examples in my own collection is priceless to me. Other than the date of April 26, 1885, what information had the pencil-wielding photo’s owner provided for me? Let me say that I wish I could go back in time, where I would grab hold of them, look them in their eyes, and shout “Use full names!” But, I can’t, so let’s move on to what they did give me, which was, “C age 28 years” and “L age 32 years.” Really? Was pencil lead in short supply? Luckily for me, there was a second contributor, either the photographer or a studio clerk, who wrote: “C W Brown Collect $2.50.” I believe this notation would have been made on the card when C.W. Brown ordered copies of the photo. I have seen people make the mistake of positively identifying a sitter in an image based on similar notations. It needs to be taken into consideration that the person ordering or picking up photos might also be a parent, sibling, or another family member of the sitter. I did a quick search for a C W Brown in the Marshall, Michigan area, keeping in mind that I would need an “L” to go along with that and that both would need to fit the ages. I came up with a Charles Willard and Jane Brown. I thought Jane may have gone by a middle name that started with L, however, her age was not even close to a match. Based on the uncertainty behind the information I had, I decided to add the photos to my collection as is. A few weeks ago, as I was reorganizing my photos, I came across this set of images and decided I wanted to share them on my blog even though I had not been able to establish full names for the sitters. After scanning and editing, I couldn’t help but take one more stab at determining who they were. I again came upon Charles and Jane living in Eckford, Michigan, which is just 6 miles from Marshall. I dug a little deeper and found that they had four children, two of whom were daughters. However, the daughters were born in 1903 and 1907 which meant that they could not be the girl(s) in my photos, which date to the 1880s. 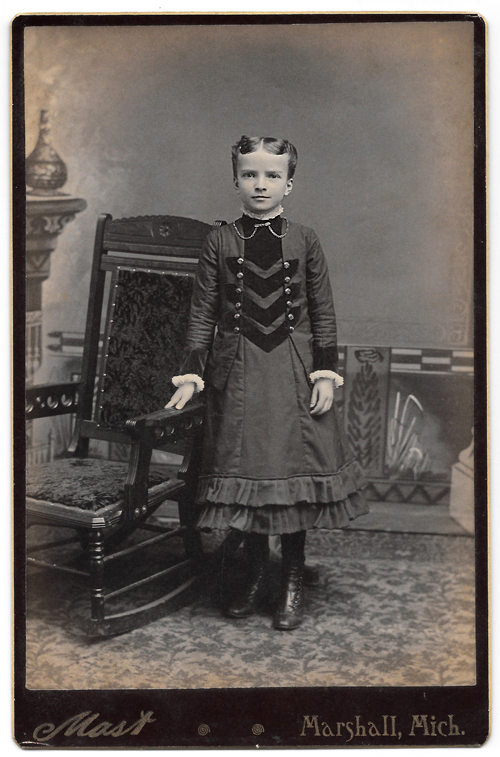 John Edward Mast, the photographer, ran a studio in Marshall, Michigan from 1876 until 1888. Just as I was about to throw in the towel for the second time, I found Charles’ Find A Grave memorial and discovered that he had been married first to a Laura (here’s my L!!!) Hamblin. Charles was born in 1857 and Laura in 1853, making their ages 28 and 32 in 1885. Bingo! I’m confident they are my couple! However, my assumption about the little girl(s) in the photos being children of the couple could not be correct, as it does not appear that Charles and Laura had children. I find no birth or death records for children other than the sons and daughters Charles had with his second wife. Also, there is no mention of children in Laura’s 1896 obituary. As a young man, Charles lived with George Merritt Howard and his wife, Emily Agnes, working on their farm. Emily was Laura Hamblin’s sister and I suspect this is how the couple were introduced. George and Emily were witnesses at Charles and Laura’s wedding on November 19, 1882. But, who are the little girls in the photos? I suspect that the photos may be of one little girl, Laura’s niece. Emily had one child, a daughter, Lydia May “Lillian” Howard. 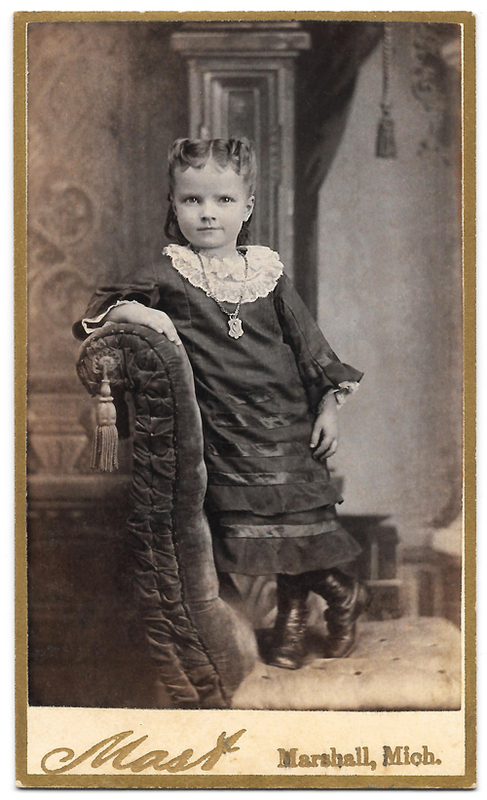 Lillian was born in 1876, which would fit with the child in the photos. Of course, all of this is merely a blend of speculation and my best deductions. What do you think, especially about the little girl in the photos? I’d love to hear your thoughts. I think what you are able to accomplish, finding out info about these old photographs is amazing! I think the photos of the little girls look like the same little girl. Thank you! I also think it’s the same little girl. Another fascinating entry! You suggest that the two pictures of little girls are of the same person, so you must be assuming two separate sittings some years apart, for it seems obvious to me that the two are of distinctly different ages. And they do certainly share a resemblance I agree. My observations are only these: The smallest girl does seem to be wearing the same or identical necklace as the woman of the couple. In the photo of the smaller child, the chair she is standing on appears to be the same chair that the adult couple are standing behind and touching. In the photo of the older girl, the rug on the floor appears to be the same rug showing in the photo of the adult couple. The furnishings linking the three really only suggest all were taken in the same studio and that is already known by the business name shown. But the necklace seeming to be the same, and shown in two photos, seems an oddity that must have significance. You suggest the girl is the niece of the woman, and state she was born in 1876 (coincidentally the year the photo business was established) and you report the date on the back of the photo of the couple is April 26, 1885, along with initials and a note to collect payment. If we suggest that date is NOT the date of the photo of the couple, but instead the date of ordering a new print, we might then suggest that the photo of the couple is a wedding portrait taken in 1882, and that the little girl is either wearing the same necklace or a duplicate as she may have been “in” the wedding party of that year (or simply taken along for a portrait at the same time), and thus aged 5+ years. (That child I would have suggested was younger than 6 but possibly not) Continuing in this vein of deduction, then the second photo of the child is in fact the same child, but now, it is 1885 and she is closer to 9 years of age and was treated to another portrait when someone ordered a replacement print of the couple’s wedding photo! I acknowledge the hole in this theory is the noted ages of the couple coincide with the date and one might logically conclude that if anyone were to write a date and ages on a photo, the two pieces of information most likely would correspond with the time and age of the subjects at the time of the photo. But for me the bottom line is that IF the two photos of girls are of the same person, they could not have been taken at the same time and so that opens up the possibility of multiple trips to the photographer’s studio. If you could find some reference to ANOTHER girl in the extended family, then they all may have been taken at one visit, and I’d suggest again a wedding time portrait, of 1882/1883. Oh yes, I think the photos are of the same little girl at different ages. She is the only girl I found in the immediate family that fit the age / time period. And I like your theory about the time frame of the photos!